View cart “Collette Dinnigan Wedding Gown” has been added to your cart. Hope Gown by Rebecca Ingram for Maggie Sottero is a stunningly striking gown with a fishtail silhouette covered entirely by off-white guipure lace which flows into a flattering full train. Sleeveless design with v-neckline keyhole feature back and fitted fully boned bodice. Sure to make a big impact on your wedding day! 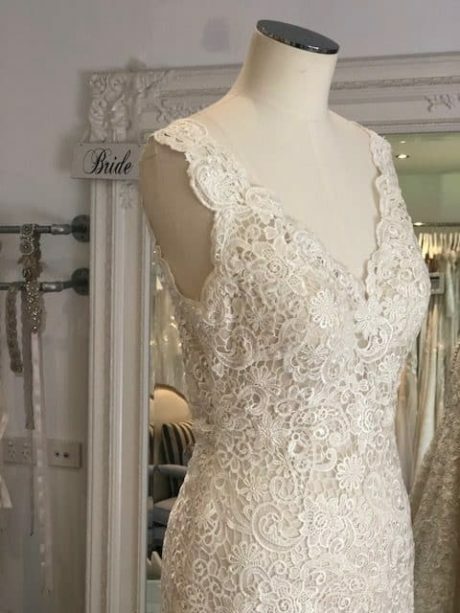 This brand new never been worn designer gown is available to try on at The Barefaced Bride studio.